Human gamma-synuclein plays a role in neurofilament network integrity. May be involved in modulating axonal architecture during development and in the adult. In vitro, increases the susceptibility of neurofilament-H to calcium-dependent proteases (By similarity). May also function in modulating the keratin network in skin. Activates the MAPK and Elk-1 signal transduction pathway. Plays a role in neurofilament network integrity. May be involved in modulating axonal architecture during development and in the adult. In vitro, increases the susceptibility of neurofilament-H to calcium-dependent proteases (By similarity). May also function in modulating the keratin network in skin. Activates the MAPK and Elk-1 signal transduction pathway. Highly expressed in brain, particularly in the substantia nigra. Also expressed in the corpus callosum, heart, skeletal muscle, ovary, testis, colon and spleen. Weak expression in pancreas, kidney and lung. Phosphorylated. Phosphorylation by GRK5 appears to occur on residues distinct from the residue phosphorylated by other kinases. Cytoplasm > perinuclear region. Cytoplasm > cytoskeleton > centrosome. Cytoplasm > cytoskeleton > spindle. Associated with centrosomes in several interphase cells. In mitotic cells, localized to the poles of the spindle. Our Abpromise guarantee covers the use of ab224884 in the following tested applications. The gamma-synuclein standard curve was prepared as described in Section 10. Raw data values are shown in the table. Background-subtracted data values (mean +/- SD) are graphed. 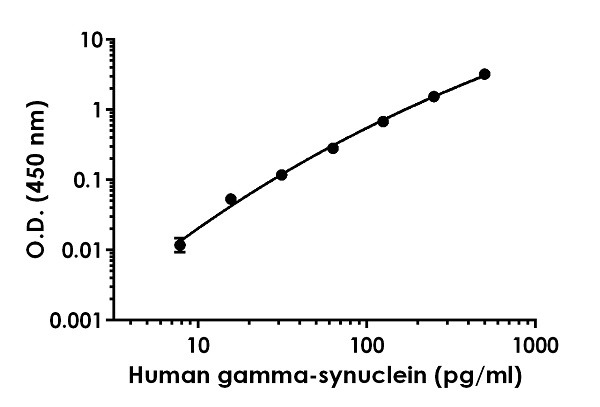 The concentrations of gamma-synuclein were measured in duplicate, interpolated from the gamma-synuclein standard curves and corrected for sample dilution. 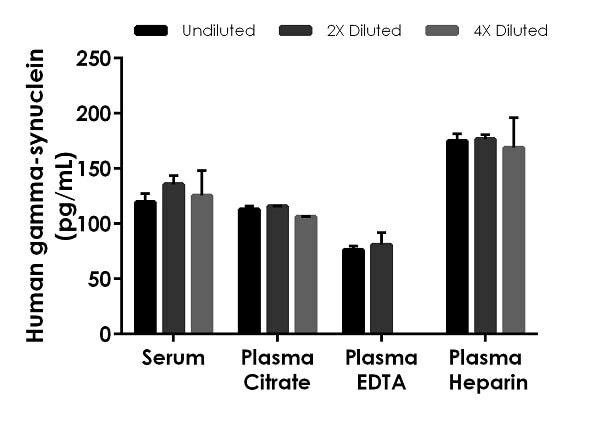 Undiluted samples are as follows: serum 25%, plasma (citrate) 25%, plasma (EDTA) 25%, plasma (heparin) 25%. The interpolated dilution factor corrected values are plotted (mean +/- SD, n=2). 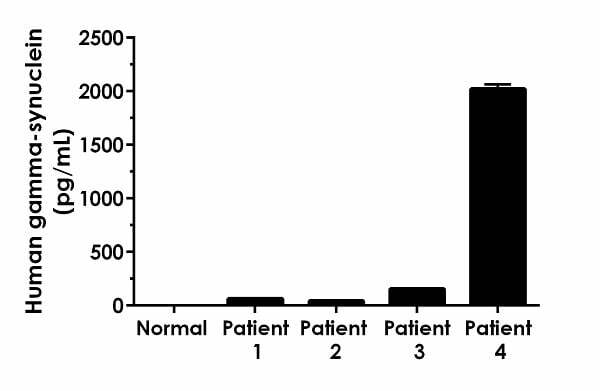 The mean gamma-synuclein concentration was determined to be 126.89 pg/mL in serum, 114.40 pg/mL in plasma (citrate), 78.63 pg/mL in plasma (EDTA) and 173.43 pg/ml in plasma (heparin). 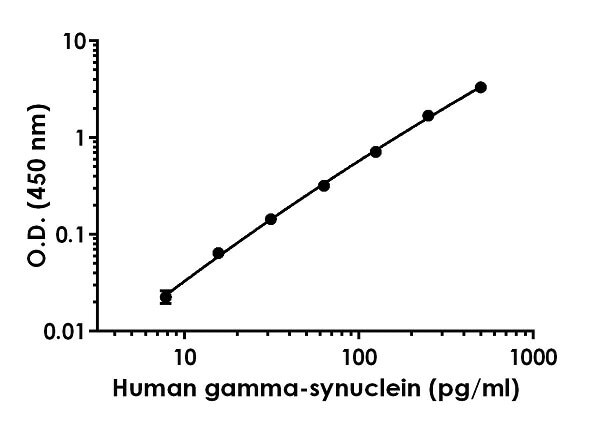 The concentrations of gamma-synuclein were measured in duplicate and interpolated from the gamma-synuclein standard curve and corrected for sample dilution. The interpolated dilution factor corrected values are plotted (mean +/- SD, n=2). The mean gamma-synuclein concentration was determined to be 2193.46 pg/mL in bladder cancer urine, 316.85 pg/ml in HT-29 cell extract. Interpolated dilution factor corrected values are plotted (mean +/- SD, n=2). The mean gamma-synuclein concentration was determined to be 180.4 pg/mL with a range of 32.92 - 451.67 pg/mL. Interpolated dilution factor corrected values are plotted (mean +/- SD, n=2). The mean gamma-synuclein concentration was determined to be 569.88 pg/mL with a range of 40.46 – 2021.56 pg/ml. The native concentration of gamma-synuclein was below the level of detection in urine from healthy human donors. ab224884 has not yet been referenced specifically in any publications. There are currently no Customer reviews or Questions for ab224884.